This takes us on to another error. Under “Burton Ale” the GBG repeats the terrible untruth that Ind Coope Burton Ale, when it appeared in 1976 as the first new cask ale from a national brewer since Camra began, was a revival of the style of beer that had been popular under the name Burton Ale until the 1950s. But it wasn’t any such thing, as I pointed out here. Ind Coope Burton Ale was a proper IPA: indeed, it was said to be based on the original 19th century Double Diamond, which, before it became an infamous keg beer, was Ind Coope’s top-of-the-line India Pale Ale. Ind Coope had brewed a Burton Ale in the 19th and early 20th centuries – a proper Burton Ale, rather dark, fruity and bitter sweet. But that brew disappeared some time after 1956, and it was only its name, not its recipe, that was revived for the beer that appeared in 1976. 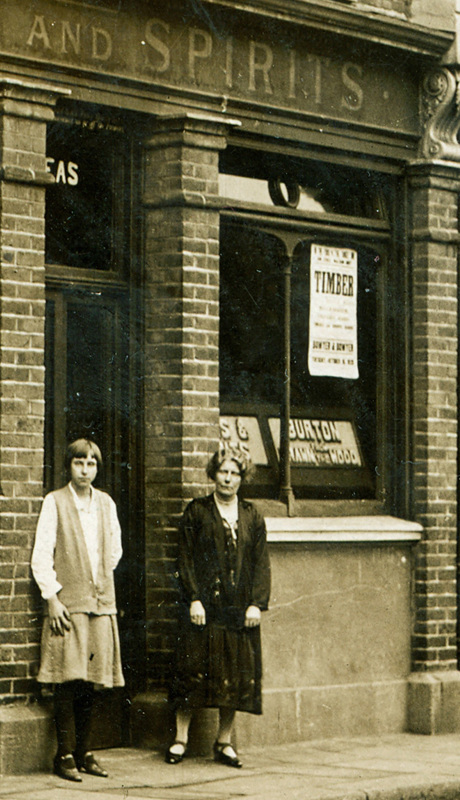 Burton Ale drawn from the wood, advertised in the window of a McMullen’s pub in Hertfordshire around 1925: that’s Burton Ale, the sweetish, dark beer nothing like the pale, bitter Ind Coope Burton Ale that went on sale from 1976. Ron Pattinson is going to go potty when he sees that the entry on Scottish beers remains unaltered: it repeats the idea that they are “darker, sweeter and less heavily hopped” than beers south of the border, and claims that this is “a reflection of a colder climate where hops don’t grow”. But hops WILL grow in Scotland (they grow in Norway, too), and, of course, Scots brewers could import them if they wanted. At the same time, Ron’s analyses of old brewing records fail to substantiate any claims that Scottish beers are less hopped than English ones, and don’t, I believe, show that they were darker or sweeter than English beers, either: an Edinburgh Ale and a proper Burton Ale are about as dark and sweet as each other, and an Edinburgh IPA and a Burton one are both equally pale and bitter. The entry also claims that “the Scottish equivalent of a barley wine” was “a Wee Heavy or 90 Shilling Ale”, again totally wrong: as Ron has shown, the only beer called Wee Heavy was brewed by Fowlers, and that was actually a nickname for what was more properly called Twelve Guinea Ale. Ninety Shilling ale was something different again, in the 19th century: a relatively low-gravity bottled pale ale. Under “Porter”, we have the bizarre claim that this was the beer that “created the first commercial brewing industry in the world in the early 18th century”. Eh? Whatever definition of “industry” you want to use, I think it’s undeniable that the widespread use of hops in Northern Europe from the end of the 13th century onwards turned brewing from a largely artisanal occupation into a proper industry, 400 and more years before the arrival of porter – see Richard Unger, Beer in the Middle Ages and the Renaissance, p52, and the subsequent chapter about beer exports by the Hanseatic League. Then we again have the totally wrong declaration that the British government banned brewers from using heavily roasted malts during the First World War “in order to divert energy to the arms industry”. Made-up nonsense, again, as Ron Pattinson has demonstrated. Any capture of the porter/stout market by Irish brewers was not because this non-existent rule wasn’t applied in Ireland, it was because Irish brewers were allowed to keep brewing at higher gravities than British ones, in an attempt to cut down on the number of grievances the Irish already had. The section on Mild contains just as grievous errors. Mild did not develop “in the 18th and 19th centuries as a less aggressively bitter style of beer than Porter or Stout”. Mild – properly mild ale – was the unaged, fresh version of ale, which began as the original unhopped British malt liquor, gradually (under the influence of beer, the hopped drink from the Continent) began being made with hops, but was around as a lightly hopped drink long before the arrival of porter and stout (which were developed from well-hopped brown beer). It was the 1960s that saw sales of mild overtaken by those of bitter, not the 1950s. And McMullen’s AK is a light bitter, not a mild: AK was always used as a designation for a lightly hopped but still bitter pale ale by Victorian brewers. Things don’t get any better in the section on Old Ale. It wasn’t “dubbed ‘stale’ by drinkers” in the 18th century “as a result of the sour taste” caused by storage for months in wooden vessels and the subsequent infection by wild yeasts: “stale” simply meant that it had stood, or aged (the word is related etymologically to “stall”), and was the opposite to “mild” or unaged. You could get “stale” porter as well, which was simply porter that had aged, as opposed to “mild” porter, which was fresh. The definition of “stale” as something that is “off” is comparatively modern. Nor was old ale “one of the components of the early blended porters”, because the early porters weren’t blended: they were “entire”, that is, made from one complete set of mashings from the same piece. Old ales, of course, were normally strong, since they had to be strong to survive ageing. As I explained here, there is no clean dividing line between old ales, strong ales and barley wines. I also showed that “barley wine” as a name is pretty much an invention of the very late 19th/very early 20th centuries. None of this, of course, is mentioned in the Good Beer Guide’s section on barley wine, which claims barley wine “dates from the 18th and 19th centuries”, and mangles the idea that very strong ales were a response to French brandy: it wasn’t “patriotism” that encouraged the gentry to drink strong ales as a substitute for brandy, it was the high taxes brandy paid and its frequent unavailability when we and the Frenchies were at war. The section also goes on about “Whitbread’s” Gold Label (originally brewed by Tennant’s of Sheffield, of course), and fails to point out that this was unique at the time for being a pale barley wine, not a dark one. That’s more than a dozen errors, in just three pages, all or almost all of which have been pointed out before. Definitely an “F” for the GBG. A publication such as the GBG will be regarded as authoritative by the general public-after all,it will argue,it’s published by CAMRA who really know their beer.The amount of effort which went in to its compilation has been sadly let down by sloppy and lazy work in this section. It’s not as if you and Ron hide your work away; any self respecting beer writer should be well aware of what you do and take steps to ensure accuracy in their own writing. For accuracy is what customers buy the GBG for after all. Ind Coope Burton Ale was in fact Double Diamond, in that it was the same beer as bottled Double Diamond but in cask form. One name to blame here I think, Roger Protz. He’s been the editor for a number of years now and all these errors are still there under his reign. What do you think of this examples of the styles? One that sticks out like a sore thumb is the recommendation of Jarl from Fyne Ales under the Scottish ales section. Great beer that it is, nothing like his description of darker and sweeter beers than in England. A lovely pale and hoppy beer it is. Just to add to the kicking, that section of the book *isn’t* produced by volunteers, unlike the entire pubs and breweries section. Unpaid volunteers go and collect the information about pubs and breweries and give it to the GBG editorial team. The bit of the guide at the front, on the nice paper, is, I presume, put together by paid staff. What would one expect when the man who sacked Clive La Pensee from What’s Brewing for “lack of originality” is running the show? In England, though, wasn’t brewing largely a household thing until the eighteenth century or thereabouts (“When Jone’s ale was new” and so on)? …refers to Protzie’s scholarship, not yours or Ron’s, as perhaps I should have made clear! Not seen the 2014 GBG yet but the errors don’t surprise me. One point on Scottish Hops though – yes hops will grow in Scotland as I’ve grown them myself. They have never been grown successfully though commercially the Duty records from the 19th century show that an attempt was made in 4 different parts of Scotland over a short 4 year period 3 of the areas had 1 acre under cultivation the highest being one year in the Stirling collection district which had 4 acres devoted to them (compared to the 60,000+ acres in Kent!). I believe there is no evidence of any commercial hop growing in Scotland before or after that short attempt. I’d be happy to learn I’m wrong & for somebody to provide information to the contrary. No, I believe that’s right – Wales and Ireland also had a small amount of hop growing as well. I am so glad that you (Martyn) are always on the look out for inaccuracies, especially when they are published (and will no doubt be quoted) by an “authority” such as CAMRA. I have often recommended your book ‘Amber Gold and Black’ and while managing a craft beer oriented bar/restaurant, as many people are interested in the history of beer and styles, and although I have given customers quick notes and info (mostly from information gleaned from your book or Ron P.’s blog) it’s not as good as reading your research first hand. I had an argument once with a BJCP judge (it got a little heated) about history of beer styles and I thought perhaps I take it too seriously, so gave up, but I’m glad to see you haven’t given up! Here in Canada and more so in the U.S. the simplicity of pigeon holed styles and uncomplicated history are attractive to the craft beer lover as it means that beer can be explained easily to the newcomer, but unfortunately until a tome as respected as the Oxford Companion to beer gets it completely right then we can only point to you and Ron (I’m sure there are others too). When CAMRA and the OCB finally get their history correct then perhaps you can retire from the battle and just focus on entertaining us with your musings and further research. Until then keep up the fight for truth! Lucky you. My judging experience had no such surprises. Some myths never seem to disappear. Just the other day someone told me that bock beer – I had brought some to a dinner – was was from the bottom of the barrel, before they were cleaned. This is one of the longest-enduring myths. Jackson theorized that drinking the last stocks of March beer in the autumn was later transposed with and embroidered over the spring maibock tradition. This one will finally disappear but it will take the present generation of boomers to pass..
One point about Scottish hopping is often overlooked. Scottish brewing was fundamentally based in two centres, Edinburgh and Alloa.These are of course coastal and the easiest and cheapest way of moving goods is by water.Even more so before the canals and railways.Scottish brewers had better access to hops than many towns in England. Ron has shown by the way that literally ship loads of hops were bought in from the Continent and the US as well as from England.Edinburgh was the world’s number 2 producer of IPA. Incidentally, it is a matter of record that the temperature in Edinburgh is within a degree or two of that in Burton throughout the year. Not all is lost in the GBG though, looking at my 2010 GBG I am interested to find that “a Dublin brewer named Arthur Guinness decided to fashion his own interpretation of the style.Guinness in Dublin blended some unmalted roasted barley and in doing so produced a style known as Dry Irish Stout” This drivel at least has gone from the new Guide so perhaps Herr Protz is simply a slow learner. Peter, you are right regarding the access via the Forth to Alloa & Edinburgh which were the main industrialised brewing centres from the 18th century onwards. Prior to the 19th century you can add Fife to the list of main brewing centres – again all the Fife coastal ports had extensive trading links with the hop growing areas of Europe & SE England & records of hop imports at all the Fife ports show a widespread import trade of hops & incidentally the export of malted barley to other areas of Britain including Edinburgh! Well limned and with almost all of it I have no quarrel: I too wish the history was better expressed. The bitter/pale thing is an, um, bitter pill to swallow: even Michael Jackson (who in truth got few things wrong) considered them the same (essentially) in his earliest writings. However, I don’t agree about Scotch ale – the true original Scotch ale or shilling ales or call it what you will was sweet and low-hopped. Countless comments in general literature and in more specialist books attest to this through the middle 1800’s, some likening it in taste to liquid honey. I mentioned these many times in comments under postings on Ron’s blog. It is no answer to this to say that IPA, say, made in Edinburgh in the 1870’s was similar in hop content to English pale ale – the Scots by then were copying English styles! So of course their beers would tend to merge in flavour and characteristics with English models and the getting-up of plant started to be similar in both places so this encouraged making more similar styles. But the most traditional styles of Scotch ale remained heavy and sweet well into the 1900’s. Even MacEwan’s Scotch Ale as sold in export markets to this day shows this characteristic, as do the Belgian successors to the examples exported to Belgium in the 1800’s. The points made above about absence of commercial hop culture underline this because there would have been less hops in the country to begin with. The fact of transporting them easier later probably did add overall to the hoppiness of Scottish beers but once again that doesn’t mean its classic variety had that character and its vestigial examples still don’t IMO. Gary, I tend to agree with you in respect of the ales that were produced by the Fife Breweries up to about 1870. The 10 breweries that survived until the end of the century all brewed what they called sweet ale – the bigger breweries (in Fife terms not national terms) such as Argyle Brewery, St Andrews, Dunfermline Brewery & MacDuff Brewery East Wemyss all had sweet ales – they didn’t call them Scotch Ales, probably because they were for the local market. The only reference to “Scotch” was they brewed Scotch Porter. From about 1870 all the breweries started advertising their new “Burtonised” beers & Pale Ales – probably too late to survive as Bass & Allsops from down south & the Edinburgh & Alloa Breweries were already making great in roads in the area – I suspect these “new” beers were more heavily hopped than before. I must confess to skipping that section this year, although on reading it in the last edition it did make me wonder. I have to say I find it very embarrassing on CAMRA’s behalf. There is some irony, I feel, in that the only section not sent to branches for checking is so full of errors. There would have been many members who could have corrected it. The problem is that CAMRA is very bureaucratic and out of touch on many levels and change, if it comes at all, filters down very slowly. So I wouldn’t expect any change in the near future. It can be difficult to make even basic corrections. For example, last year I alerted the local branch chairman (who I know) that one pub near me was listed as “featuring eight handpumps offering an ever changing range”. It doesn’t and never has. Imagine my surprise to see the very same entry in this year’s GBG. Anyway, looks like we know who next year’s editor of the GBG should be! Martyn/Tyson – To me, “The Guide” used to be a bible. For the last 10 or so years however….Mr Protz, being the editor, is responsible for its proof reading and presentation to the wider world. I hate to come over like a capitalist, but, shouldn’t somebody who presides over such a slipshod publication be replaced? Fancy tthe job Martyn? No. The idea of dealing with hundreds of Camra branches all clamouring for more room in the GBG fills me with horror. Similar to the ‘pale ale’ nonsense, the other thing that really irritates me about the GBG and CAMRA narrative in general is the constant assertion that ‘golden ale’ is somehow different from ‘bitter’ and was invented in about 1998. All ‘golden’ does is describe the colour. It’s not a style of beer. Lots of beers were lighter in colour long before the term ‘golden ale’ was coined, especially in the North West – Boddingtons etc. It’s a subcategory AT BEST. I know they’re trying to correct the public misconception that all beer is either ‘lager’ or ‘bitter’, but by trying to exclude beer that clearly is in the ‘bitter’ category they are equally wrong and equally misleading. I couldn’t agree more, Benjamin. It irritates me as well. As you say, Boddington’s Bitter was extremely pale (if you walked into a Boddington’s pub in the 1970s, you would see everyone apparently drinking lager), and it was, of course, a cracking pint until they changed the recipe (I think in 1981 or thereabouts – long before the takeover by Whitbread). It’s unfortunate that the GBG gets it so wrong despite living in the information age and in light of all of the brilliant current research findings. I guess myths and legends die hard when they’ve been drilled into folks for so long. It’s no better here in the states, especially with things like the BJCP “guidelines” being given far more importance than they deserve. The inaccuracies and myths propagated by Camra come as no surprise. I was a branch committee member in the late 80’s/early 90s and the infighting and politics made campaigning and supporting cask ale seem like a secondary function, so I eventually left. The GBG is no longer an authority on beer, but a subjective list of Camra members’ favourite watering holes, and from that I can only conclude that many of them have difficulty in identifying what is actually a good pint of cask beer. When multiple old sources all say the same thing, then I believe them. But these old docs include actual brewery records.These tell what sort of malts were used, hopping rates, fermentation temperatures,boil times and how the beers were matured……….enough I feel for us to make a pretty fair guess about beers in the past. I would like to add a word about the industrialization of beer. If any beer should be considered the cause of the industrialization I would think it would be porter not IPA. Porter because of its long aging naturally favored brewers with large amount of capital to invest in storing it, as its success grew these brewers also began to invest in new technology such as Whitbread’s use of Watt’s steam engine. 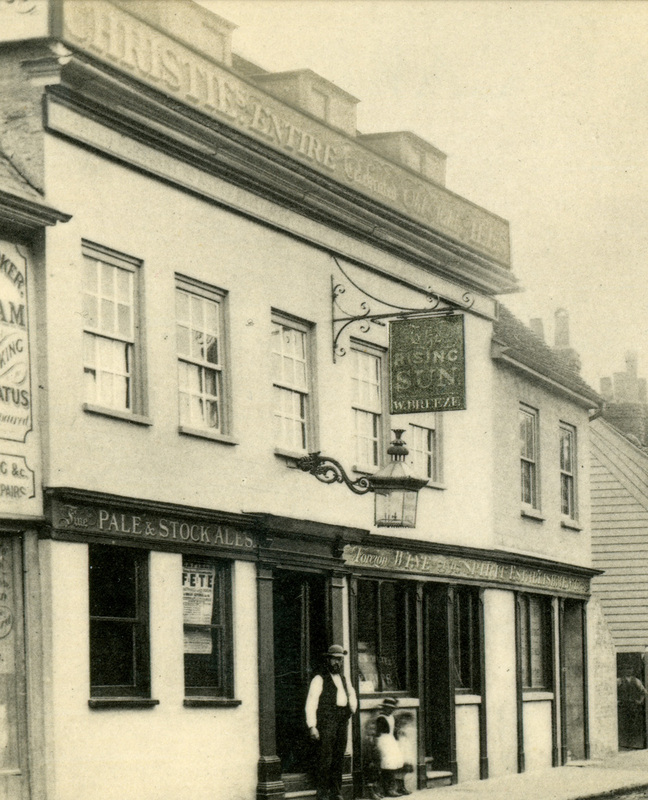 The growth of the London population during this period also helped to exacerbate the trend to drink commercial beer rather than home brewed beer. I would also point out that the 18th century is when men in the guise of professional brewers began to take brewing ( and distilling I might add) over from the women and move it from the home to the factory. It still amazes me how complete this take over has been. Men now totally dominate the commercial and homebrewing industry here in the U.S., only very recently has this trend begun to reverse. I do hope that the efforts of the Pink boots society and others will begin to bring the ladies back to drinking and brewing beer. Thanks Martyn for your wonderful work in beer history and for this forum that allows all us geeks to learn and debate! Well, I haven’t read the offending chapter, but it’s blatantly true that Scottish ales are darker, sweeter and less hopped than English. You only have to go to Edinburgh and order a pint to see that. So if the books states that, it’s correct. I suspect you’re putting too much weight on something you read in a library that says that something was the case hundreds of years ago, as if that’s the One True Way and that nothing ever changes or evolves. it’s blatantly true that Scottish ales are darker, sweeter and less hopped than English. Unless you have statistics to prove that, I suggest you’re guilty of what is known, technically, as “talking shite”. I believe that the biggest selling Scottish beer is Deuchar’s IPA which isn’t dark when I look at it and is reasonably well hopped. Pingback: American Pale Ale | Dangerous Man Brewing Co.